The island of Madeira, a Portuguese colony that lies far out into the Atlantic, has been famous for producing many things over the centuries, from sugar, to bananas, to exotic flowers. One constant through that time has been wine. And Madeira is one of the most distinctive wines in the world. Only around 420 hectares is planted with the six traditional varieties that are permitted. Of these, Tinta Negra Mole makes up around 85%, mostly used in the cheaper wines along with Terrantez. Whilst Tinta Negra Mole is capable of making very good wines, around 60 hectares more are planted to the noble varieties: Sercial, Verdelho, Bual and Malmsey. There is a very active movement towards reclaiming the traditional and noble varieties, with EU-backed replanting programmes underway. 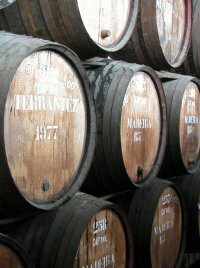 Madeira is a fortified wine, where heat and evaporation are key to its production. Wines lie in old oak casks in warehouses, where the heat of summer works to concentrate colour, sugars and alcohol. Evaporation runs between 2% and 5% per annum making the wines strong, rich and oxidised in style. Less expensive wine is no longer vinified in casks (the Canteiro method), but in Estufada – large steel tanks that are artificially heated to mimic the Canteiro process. Today, Madeira production involves only a handful of companies, following a series of takeovers and consolidations during the last century. In spring 2007 I visited Madeira, to see three of the island’s producers. First up was Henriques & Henriques (H&H), the biggest independent company on the Island. I then moved on to the giant of the industry, the Madeira Wine Company (MWC), an association now jointly owned by Blandy’s and Port shippers, the Symington family, which has absorbed numerous smaller producers and shippers over the years. MWC is responsible for 50% of all Madeira production, and trades such well known brands as Blandy’s, Cossart Gordon and Leacock & Co. The final stop on my itinerary was a return visit to Barbeito, the smaller but high quality house I last visited in 2003. UK distributor: Mentzendorff, Tel: +44 (0)20 7840 3600. ‘H&H’ is one of the most famous names on the island, founded in 1850 by Joao Joachim Henriques. I was greeted by John Cossart (left), who is the second generation of Cossarts to run the company. 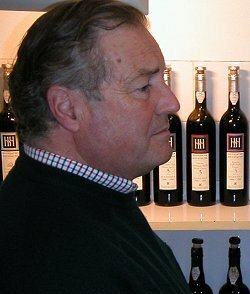 Unlike many of the island’s producers, H&H has substantial vineyard holdings of its own, and indeed, has been expanding its vineyard estate in recent years. The affable John Cossart, very much of the English old school, has in fact been a dynamic force in the company, driving this estate expansion and overseeing the building of a brand new winery. He has also re-packaged the company’s range in striking contemporary livery. 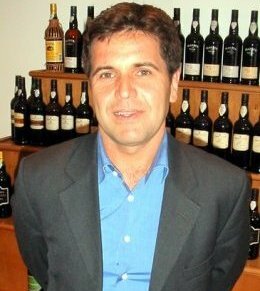 Henriques & Henriques winemaker Luis Pereira was also awarded ‘Fortified Winemaker of the Year’ in the International Wine Challenge. Note: sadly, John Cossart died in 2008. UK distributor: Raymond Reynolds, Tel: +44 (0)1663 742230. On my 2003 visit the range of wines being produced by Ricardo de Freitas (left) really impressed, not just for quality, but for being amongst the most distinctive on the island. Returning four years later to the Barbeito cellars, there is still plenty of evidence of experimentation and ambition. 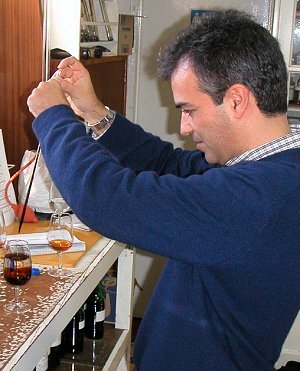 In the photograph, Ricardo is adding a minute amount of caramel to a wine for our education: he abandoned the use of caramel as a colouring and flavouring agent many years ago, though most commercial wines from other producers still use a small amount. Tasted on its own the caramel was acrid, but it instantly turned a golden wine deep, mahogany brown. In any Madeira cellar the winemaker is as much archivist and mathematician as winemaker: the various vintages, grapes and maturation options put an enormous number of components at his or her disposal. Included in this tasting were some new single cask wines, wines made by blending two specific casks, and old blends bottled for the US ‘Rare Wine Company’. UK distributor: John E. Fells & Sons Ltd., Tel: +44 (0)1442 870900. Behemoth of the Madeira scene, The Madeira Wine Company may produce half of the island’s wine, and coach-loads of tourists are processed through their Funchal lodge each day, but this company still has stocks of rare old vintage wines, and continues a top quality tradition on the island. But winemaker Francisco Albequerque (left) is also one of the island’s great innovators, with superb modern single-vineyard wines and the ground-breaking ‘Alvada’. The noble Madeiras have always been exclusively varietal wines, but Alvada is a blend of Malvasia and Bual, with a very contemporary appeal. The 1988 Cossart Gordon Single-Harvest Sercial is one of the best wines I tasted on this trip, yet sells in the UK for a modest £15.00.